These cold, dark winter evenings have been pretty uninspiring. After countless attempts at photographing recipes with no joy, I gave up. Instead I've spent my spare time this week wrapped up on the sofa watching Netflix and working my way through a delivery of Lindt. It's a hard life! After more truffles than I dare count, I decided it may be wise to share maybe just a few. To do so I've come up with the ultimate cookie recipe. Soft on the outside, perfectly gooey on the inside and packed full of chocolate. These are so good, I've made a few batches to share and some to store away in the freezer. In true Nigella style, its always a good idea to have a log of cookie dough stowed away. You can bake it straight from frozen and slice off one or two cookies at a time. I've also boxed some up to give as gifts, albeit early ones. 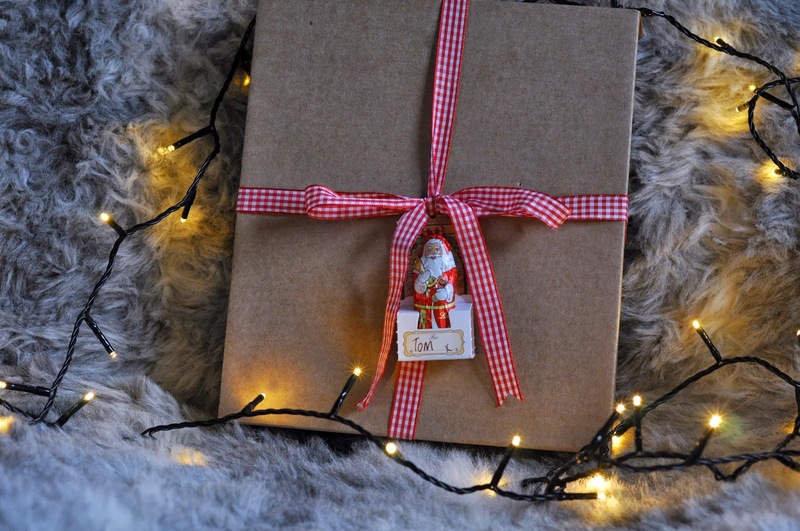 It won't be a surprise to my loved ones that this year's Christmas wrapping theme is chocolate! These mini Santa chocolates come in a pack of 5 and are perfect to use as gift tags or as table settings on the big day. 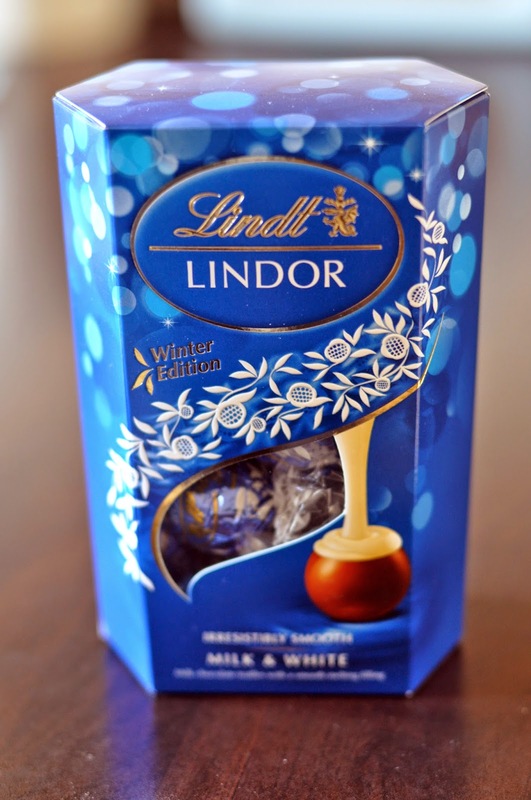 My absolute favourite Lindt are these Winter edition milk and white chocolate truffles. 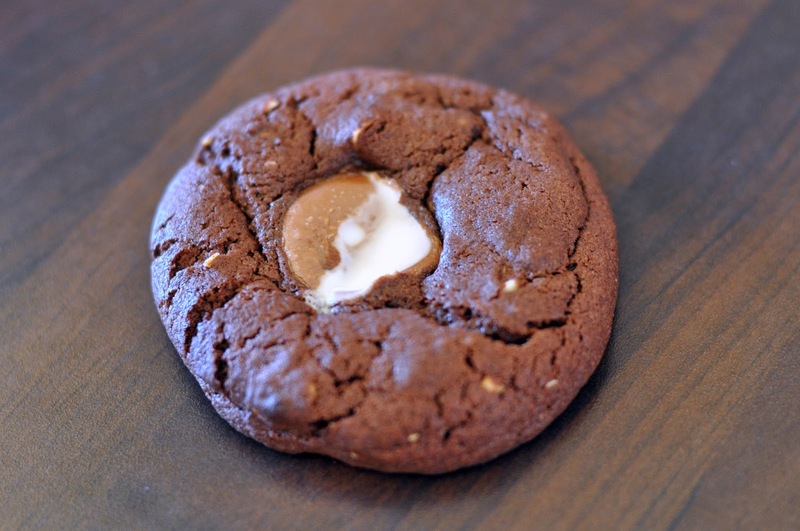 They're perfect for cookies as the white chocolate centre oozes out and looks great. 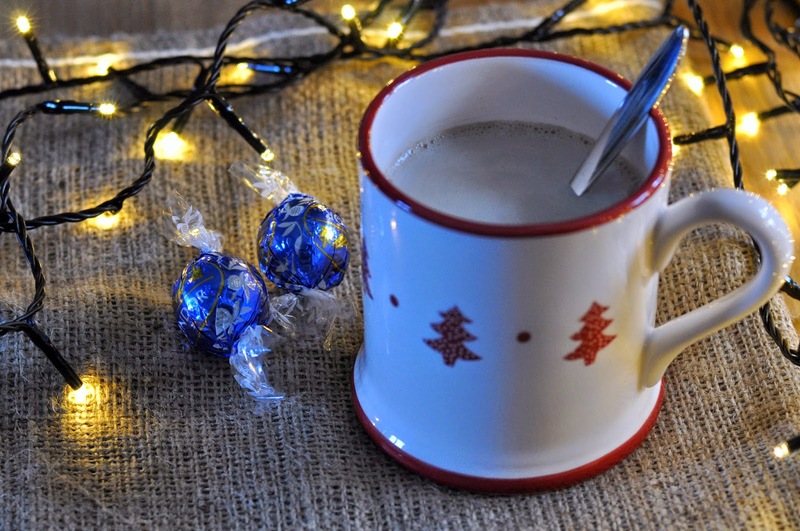 I also have one more trick...Lindt hot chocolate. 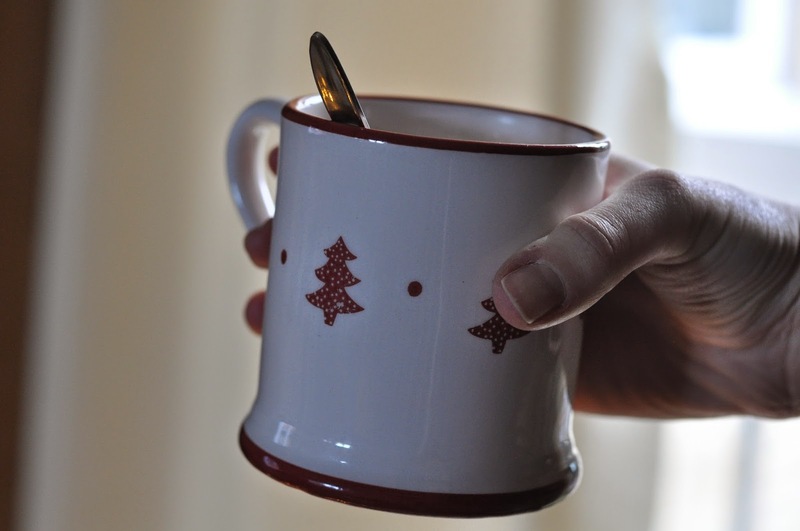 Heat some milk in your favourite mug in the microwave, drop in 3-4 Lindt truffles and give it a good stir. Undoubtedly the best, most speedy hot chocolate you can make at home. Cream together the butter and sugar until light and fluffy. Gently beat in the egg. Fold in the flour and cocoa powder, adding a splash of milk if needed to loosen the mix. Fold in chopped nuts or chocolate chips. Dollop the mix onto a large sheet of baking paper and use to roll and wrap into a sausage shape. Place in the fridge to firm for at least 30 minutes. (I prefer to whizz up the cookie mix the night before needed and leave to chill overnight). Line two baking trays with baking parchment and divide the mixture into 12 equal sized balls. Squeeze a truffle into the centre of each and place evenly spaced onto the baking trays. Don't be tempted to flatten the cookie balls down, they'll drop whilst baking in the oven. Place in a preheated oven at 220 degrees and bake for 10 minutes. They will have flattened but will be floppy. Leave them for 20 - 30 minutes to firm after removing from the oven. Feel free to experiment with your truffle flavours. My favourite of all the batches so far have been adding chopped hazelnuts to the cookies and dunking them in hot chocolate made with hazelnut milk. And if you're going to do the Nigella-esque trick, wrap the cookie dough well, label up and freeze away. It should last up to 3 months, or alternatively a week in the fridge. I also have the cutest chocolate Christmas decorations ready for my tree. No doubt I'll be joining in with the rest of Twitter and Instagram when it's up and showing everyone just how cute it is...if they don't get eaten first. Thank you to Sally for kindly sending me these samples from Lindt. Please note, all enthusiasm for Lindt chocolate is my own...who can resist the Chocolate Santa's and Easter Bunnies? !